The feeding roles of invertebrates of fluvial ecosystems are categorized according to food sources and mechanisms of food acquisition, which in turn are related to morphological and behavioral adaptations of the consumer (Table 8.1). 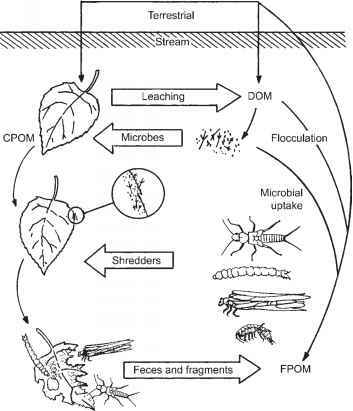 These FFGs (Cummins 1973, Merritt and Cummins 2006) reflect the four most important food resources found in streams: periphyton, CPOM, FPOM, and animal prey. Shredders feed on CPOM, collectors feed on FPOM either from the water column or the streambed, scrapers ingest periph-yton, and predators consume prey. However, this classification has limitations. Most macroinverte-brates likely function as collectors in their early instars, so FFG designations apply best to late instars. FFG classification usually is at the level of genus, raising the question of species-level differences. The food resources do not separate cleanly; for example, a leaf enriched by fungi may support a surface film of algae, and biofilms are not well incorporated into the FFG classification. TABLE 8.1 The functional feeding groups (FFGs) of macroinvertebrate consumers in streams. See Cummins and Klug (1979) for further explanation.